Modern medicine, how sophisticated it may be, views the human body as matter, while homeopathy, founded by Samuel Hahnemann, sees the body as governed by the soul. Although the merits of modern medical techniques are undeniable, homeopathy has the potential to truly cure illness and restore man's wholeness of body and mind. Himself a successful long time practitioner of homeopathic medicine, Pieter Michel Constant shows that the ancient philosophy of Aristotle, long neglected, can serve as the foundation of a new theory of homeopathy or Homoeopathia Pura. In a detailed analysis Constant argues that Aristotelian philosophy helps to explain the effectiveness of homeopathic treatment. It also helps to understand the root causes of the disintegration of body and soul. Pieter Michel Constant was a homeopathic doctor for more than thirty years. He is also a philosopher, studying the theoretical basis of homeopathic thinking. 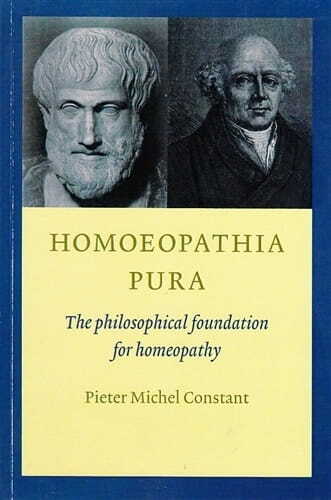 His book Homoeopathia Pura is essential reading for everyone interested in homeopathic theory. This book seems to be mainly about homeopathic methodology and philosophy, with some consideration of the science of water and other questions related to homeopathy. It covers the author's approach to case-taking, repertorisation, choice of potency, and the nature of the vital force, questions of complex homeopathy, and more. The author has been a homeopathic doctor for thirty years and is also a philosopher. But the first thing I noticed about the book is that the English is not good. For example the chapter title 'Some homeopathic advices to the clinical colleagues' is off-putting but "Within the homeopathic community itself however, there was also some room for lack of understanding, for the own and specific nature of the homeopathic medical science. "(p65) is confusing. I often found it very hard work to follow the argument of the book. When a few sentences like that piled up, I sometimes gave up. The book was originally published in Dutch, there is no mention of a translator so we must assume the author translated it. I think this book asks some interesting questions. I would have liked the language and layout to be more accessible, so that I could find some of the answers more easily. Sometimes fairly standard homeopathic ideas are mixed with unusual ones, so the book is neither advanced nor introductory. It seems to me also that some individual ideas of the author are mixed with more commonly held ideas. I wonder if all this is clearer in the original Dutch. So, a wide-ranging book, commenting on modern science and politics, ethical questions, ancient philosophy, Hahnemann, Aristotle and Plato. It tackles many of the important questions in homeopathy, and puts forward some interesting ideas.